For the region, see Hindustan (region). 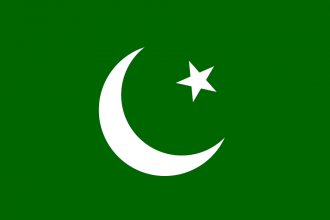 Hindustan is a formable country representing a unified India under native Muslim rule. Despite the name, only Muslim states may form it (Hind is the Persian name for India, from Avestan Hapta Hindu, meaning "Seven Rivers." Hence "Hindu" is an ethnic and geographic identifier, not a religious one. The suffix -stan means place/land in Persian). Hindu states may form Bharat instead, while Central Asian Muslims may form the Mughals. Hindustan obtains new national ideas when formed. 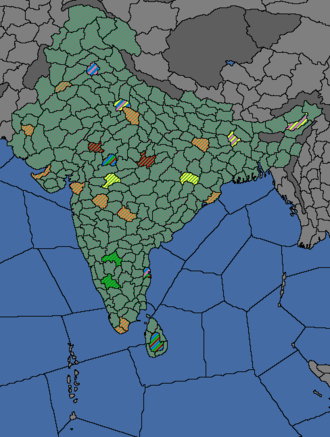 All orange provinces must be owned and cored to form Hindustan, as well as the colored provinces (Dravidian green, Western Aryan red, Hindustani blue, Eastern Aryan pink, Central Indian yellow). Shaded provinces are permanently claimed after formation. There is a separate decision to form Hindustan for each of the five main Indian culture groups. Depending on the culture group of a particular nation, different provinces will be required to form Hindustan. The provinces required are in the same general vicinity as the culture group. has a culture of the Central Indian culture group. Multan (506), Surat (517), Delhi (522), Central Doab (524), Burhanpur (527), Madurai (536), Daulatabad (545), Cuttack (552), Sambalpur (553), Pataliputra (558), Gauda (563), Assam (566), Bidar (1948), Halar (2052), Kumari (4410), and Mansura (4503).